XANDRIA is a female fronted Symphonic Metal / Gothic Metal band from Bielefeld, Germany. The band was formed in 1994 and released following albums: "Kill the Sun" in 2003, "Ravenheart" in 2004, "India" in 2005, "Salomé - the Seventh Veil" in 2007, compilation "Now and Forever” in 2008, "Neverworld's End" in 2012, sixth full-length album "Sacrificium" is just around the corner by Napalm Records. “Dreamkeeper” begins like nearly anything similar to some of NIGHTWISH’s tunes, stunning singing and melodic haunting music parched by a slicing lead fretwork. “Nightfall” displays a fantastic orchestration, igniting a catchy chorus with shrivels of power from within. Title track “Sacrificium”, which is the longest Epic tine going over 10 minutes, is filled with a selection of awesome ideas consisting of a thrilling Gothic choir, fast paced assorted drumming, mood changing atmospheres, operatic frontline, and massive riffery that might send you to NIGHTWISH fused with RHAPSODY OF FIRE. “Come with Me” might be indulging tenderness but rapidly bombed with thick Metal combustion, a truly impressive tune leaving its memorable mark. “Little Red Relish” portraying another fine showcase of vocals by Dianne Van Giersbergen alongside wonderful symphonic melodies and mega powerful riffs that are overwhelming, proving another round of creativeness. “Stardust” has everything that a true Symphonic Metal should have, simple brilliance over and over without a sign of diminishing. “Until the End” and “Temple of Hate” raising the bar towards the Folk side of Metal, a slight change of venues for the band this time, but quite refreshing. “Our Neverworld” and “The Undiscovered Land” are the albums’ masterpieces, once again employing Folk Metal attributes, the latter serve as an emotive balladry, such an intense atmosphere that is up above the charts. 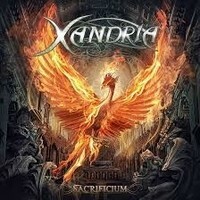 XANDRIA again proves that they are one of the top acts in the Symphonic Metal nowadays. "Sacrificium" shows an inspiring production, no less that on a higher level up the scale. Musically, this is first rate, assorted, multifarious and piercing through on to the bone. Highly recommend to every Symphonic Metal fan out there but also to everyone calling himself / herself a Metalhead. I couldn't stop listening to these beautiful songs due to their captive hold. Get yourself a copy to be a witness as well.